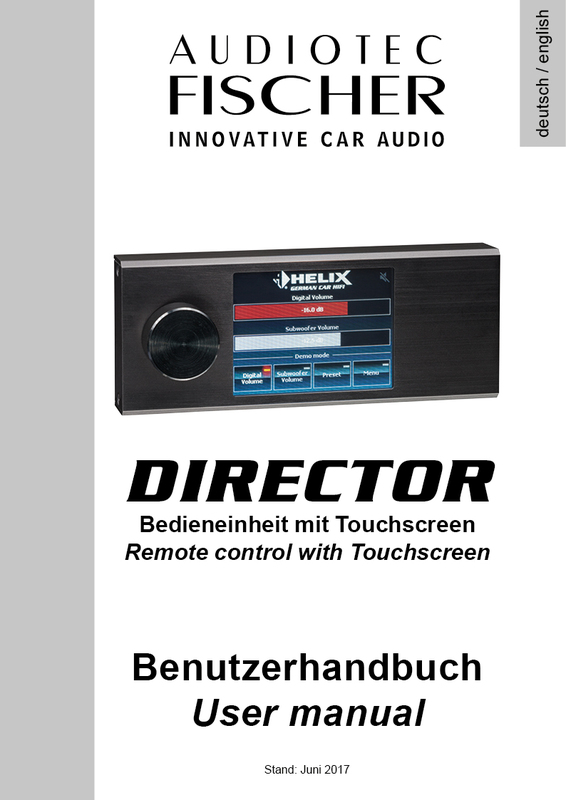 The DIRECTOR is the first touch screen controlled remote from Audiotec Fischer. The device is capable of managing all of the primary functions of the DSP. The DIRECTOR is compatible with all DSP products from Audiotec-Fischer which have support for the DSP PC-Tool Version 3 and above. To guarantee long-term updatability, we have used an ARM processor which offers us the capability to integrate new features in future without having to build a completely new unit from scratch. We did it this way because we believe in giving our customers the very best value for their money. With the DIRECTOR, you can comfortably adjust the master, subwoofer, HEC / MEC / AUX and digital volume from the driver's seat. 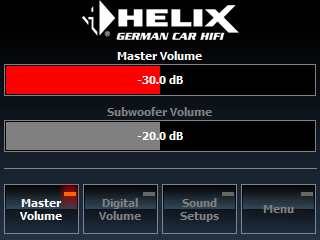 The control range is between -60 dB and 0 dB for master, HEC / MEC / AUX and digital volume and between -40 dB and 0 dB for the subwoofer. The volume is adjusted in 0.5 dB increments. The "Input Select" menu allows for switching between the input sources. Depending on the connected device, the possible options are Main, HEC / MEC / AUX and Digital Optical are available as input sources. In addition, the volume of the selected source can be set here. The DIRECTOR allows direct control of the HEC / MEC BT extension. Once a connection has been established successfully between the Bluetooth device and the HEC / MEC module, it is possible to control the module via the DIRECTOR. In addition to play / pause, forward and backward songs, the volume of the Bluetooth input source can also be adjusted using the rotary dial on the front of the DIRECTOR. The "Tone Control" function allows for the bass and treble levels, as well as their transfer frequencies to also be set via the rotary knob of the DIRECTOR. To update the firmware of the DIRECTOR please download the Updater and install all programs which are included in the installation routine. You need "administrator rights" on your PC to install the programs. Close the DSP PC-Tool software if it is still opened. The update process can take several minutes. Please wait until the process is successfully finished. Do not remove power from the device during this procedure. Do not launch the DPS PC-Tool Software during the update. Install the provided USB driver in the installation process. Note: It is mandatory to update the DSP PC-Tool to Version 4.42a or higher to use this DIRECTOR Version. Before installing the DIRECTOR Updater 1.75 / 2.00, it is also mandatory to uninstall all previous DIRECTOR Updater versions and the ATMEL SAM-BA from your computer to avoid problems during the update. Install the DIRECTOR Updater (re-start your computer after its first Installation). Connect the DIRECTOR via its USB port to your computer and turn on the device. Activate the "System Update" function in the DIRECTOR menu (Menu --> System --> System Update). Launch the DIRECTOR Updater software. Click on "Update DIRECTOR" to start the update process and follow the instructions. Please note: The DIRECTOR will be shut down for the update process. Neither the display nor the device itself will have any function until the update is finisched. Attention: All adjustments will be set to default values and all stored sound setups in the DIRECTOR (No. 3 - 22) will be erased! ACO platform - The volume slider for ACO products can now also be aligned vertically. This adjustment can be found in the menu under Usability Settings / Slider Orientation. ACO products can now be used with the DIRECTOR (firmware 2.00). The function set is nearly identical as with the actual products but the execution of the functions is doen much faster. A sound setup switch does now take less than a second. Due to this new concept the maximum number of available sound setup memories (10 sound setups) will not be increased in combination iwth the DIRECTOR. A new option has been implemented to hide the 2. deactivated Sound Setup in the Sound Setup selection. To do so choose the 2. Sound Setup and press the rotary knob. A new synchronization menu has been added under Menu -> System. Remote Controlled Sync (Lightwire configured as Remote Input). Additional Connect Delay +1-45 seconds. HEC HD-Audio USB-Interface support added. Failsafe Mode has been added: press the pushbutton for 10 sec. to enter Update Mode. Screensaver – A new Logo Screensaver has been added. Support of the HELIX DSP, MATCH PP 62DSP, MATCH PP 82DSP and MATCH M 5DSP has been implemented in combination with the use of DSP PC-Tool V4.10c. This update is not relevant for all other supported devices. Before installing the DIRECTOR Updater 1.61, it is mandatory to uninstall all previous DIRECTOR Updater versions and the ATMEL SAM-BA from your computer to avoid problems during the update. MATCH PP 86DSP has been implemented. HELIX P SIX DSP MK1 update for DSP PC-Tool V4. Before installing the DIRECTOR Updater 1.60, it is mandatory to uninstall all previous DIRECTOR Updater versions and the ATMEL SAM-BA from your computer to avoid problems during the update. 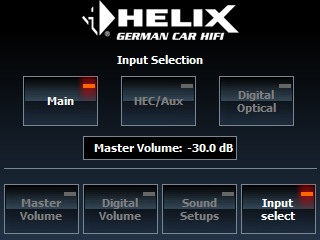 HELIX DSP PRO MK2 has been implemented. HELIX DSP.2 has been implemented. New Menu Screen Design has been added to change the background image. HELIX P SIX DSP MK2 update for DSP PC-Tool V4. HELIX V EIGHT DSP update for DSP PC-Tool V4. HELIX DSP PRO update for DSP PC-Tool V4. HELIX V EIGHT DSP has been implemented. A new design menu has been added to change font style and font size. A new function (Auto Source) at the usability menu has been added, which allows after activation to change the input source automatically depending on which volume page is selected (e.g. 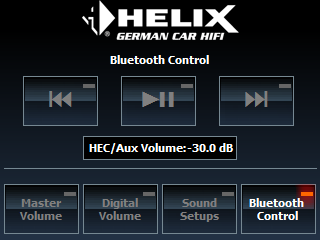 HEC/Aux Volume activates automatically the HEC/AUX input source, etc.). Voltage/Temperature monitor for specific devices has been added (supported by HELIX P SIX DSP MK2, HELIX V EIGHT DSP, MATCH M 5DSP, MATCH PP 62DSP). Screensaver function for this Option has been added (Off - 15s - 30s - 45s). Bluetooth volume adjustable in "Bluetooth Connect" screen has been added. Error system has been added - a warning symbol will appear on top of the screen if a failure is detected. New internal memory management system has been added. MATCH M 5DSP has been implemented. 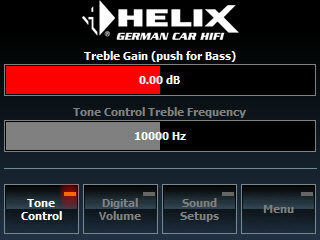 DIRECTOR Tone Control - Bass and Treble level control. To activate this feature go to the DCM menu in the DSP PC-Tool software and enable the DIRECTOR Tone Control. After this procedure a new menu can be assigned to one of the soft keys called Tone Control. The pushbutton can be used to toggle between Bass and Treble control. In addition you can control the crossover frequency for each function. Minor bug fixes and optimizations of the timings. HELIX P SIX DSP MK2 and MATCH PP 62DSP have been implemented. The "Menu" can now be opened by clicking for 2 seconds on the brand logo. Volume control of the active source in the "Input select" menu added. The "Startup volume" function can now be applied to specific sources and will not be triggered after a Power Save Mode wake up. A "Retry" button was added on the "Unknown Device" failure page. ATT/Mute status will not be saved over a restart. Improved syncronisation with the DSP - Please contact our support if you are still having syncronisation issues. Minor bug fixes (boot & startup). BRAX NOX4 DSP support added. Bluetooth volume adjustable in "Bluetooth Control" screen. Display Timeout brightness can now be set to 0 which shuts off the display after the time out. Unused Functions Menu - all unmapped functions can be accessed via this menu. Minor bug fixes (usability and communication). Release-Version of the DIRECTOR firmware. Information on the implemented features can be found in the DIRECTOR´s instruction manual.